I read the first handful of comments, which confirmed my belief that our home-schooled kids are getting the best education. Just read a few of these poorly written comments, the grammar and spelling speaks for itself. I especially like the comment from one public-educated student, "some parents may sugar code the kids." What is this sugar code? I think we could definitely use that, I love sugar. In my opinion, i would never turn to home schooling. When you are home schooled, you automaticly loose the whole social experience of school. In the real world you need to be social. Otherwise you’re going to get know where. I understand that the learning education might be to an advantage while homeschooling because its all one on one and you are the only student reciveing all the help you need whenever you need it. 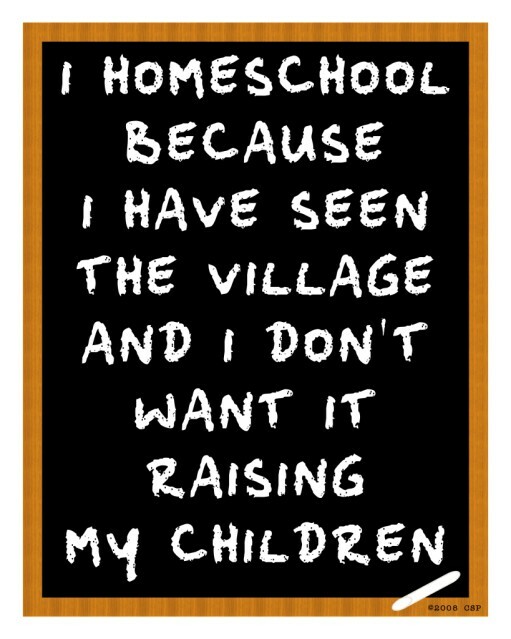 I would never home school my child because I would be holding them back from friends and the social life they will need in the feature. I would never even consider home schooling. I believe that home-schooling doesn’t prepares children and teenagers for the ” Real world”. It doesn’t let children that chance to be in a social community with more kids or people. I think Home-schooling has his dos and dont’s. I think homeschooling is dumb. I think homeschooling doesn’t prepare kids for the real world. they don’t learn how to socialize with other people. Some parents may sugar code the kids. So they might not know everything there suppose to know. no i do not agree. Very interesting. I have a 4 year old I'm doing preschool with right now. I've been really struggling making the decision of Public school or homeschooling. I went to public school and my husband was home schooled. We are both open for both. I just want the best for my children.